Yep, it's perfectly fine to mention anywhere on the site now. :) Dress to Impress is correct. 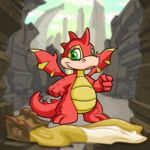 It seems there are some downsides to having a Neopet as unique as the MSPP. Contacts and clothing are made for the standard body type, and if the body type of your Neopet (such as the eyes of an MSP) differs from the standard to make it more unique, then customisation can suffer. If your Premium lapses, you will be prompted to either transfer or abandon your 5th Neopet. If you choose to abandon it to The Pound, it will be held there for 90 days, giving you plenty of time to reclaim it before it is put up for adoption. According to our support staff, if your only Lab Ray is located on a side account, then it's acceptable. If you have access to the Lab Ray on your main account, then it must be used there. Players may not have other players advertise their Beauty Contest entries for them. That's the rule, and if someone is doing something against the spirit of that rule, then please report them with as much detailed information as possible so we can make the call and take any action if they are not participating in a proper manner. You can send it in as often as you like, though if you repeatedly send it in during a short amount of time then the doubles will simply be deleted by our judge. Every two to four weeks is more reasonable. Also, we don't delete the submissions that didn't win, and we occasionally spotlight entries that were submitted weeks or even months ago. Thanks to everyone that sends us art, by the way! Nope, that's just fine. :) There's nothing wrong with multiple IPs, as long as there isn't anything super suspicious going on. Sounds like a good idea to us. :) Enjoy! No. Non. Nicht. 没有. Geen. iie. Nej. Nu. Não. If it's becoming an annoyance, we recommend that you block the player. This will stop them from being able to bid on your lot. If they move to another account to continue their bids, then we feel it would move from annoyance to harassment. We're having our programmers look into the issue again. Hopefully they can shed some light on the issue, and we don't mean a glaring white page lighting up your monitor at night. Like the word platypus, there is no universally recognised plural for Bartamus. Bartamuses is the most commonly used plural form, but Bartami and Bartamus are acceptable, as well. *sigh* That's very nice, Dragona. There lies a barrier between dreams and truths, one that all are aware of, few can see, but none can truly cross. It was a dark and stormy night. Forks of lightning sliced through the black sky, thunder pounded in my ears... Just kidding. Yanli skipped up to the front doors of Castle Nox. She looked up at the imposing place, a grin on her face. It looked like there was a lot to explore. Contrary to popular belief, waitresses and waiters do form opinions about their customers, and they aren't always nice ones.